Did you know that using the Walden Writing Center’s paper review service three or more times can impact your academic success much more than using the service once or twice? New research has found that visiting a writing center more than twice positively impacted student success. Maybe you are new to academic writing or returning to writing. You might feel a little uncertain about your writing skills or have received feedback that indicates you have skills to work on. Or, perhaps you feel confident about your writing skills but still want to advance those skills. Maybe you just aren’t sure about your writing and would like a secondary reader, and you’d like to schedule some Writing Center appointments. You may be wondering how to fit the Writing Center into your already busy schedule to take advantage of this service and enhance your skills. Well, we have some options for you! You can make an appointment at the next available opening on the appropriate schedule and submit something you’ve recently written for class, even if you’ve already turned it in. Your writing instructor will provide positive, encouraging feedback and links to additional sources we think will help you work towards your learning and writing goals. You can even let us know in the appointment form that your document has already been turned in and you’re looking to see how your writing is going so far. Or you can always submit whatever you’re working on that week. We suggest, at this stage, that you review your first appointment and look into some of the additional resources provided by your writing instructor. Using that feedback, you can work to implement changes in your document and reflect on skills you’d like to focus on in the future; these skills might be organization, APA, using source information effectively, etc. 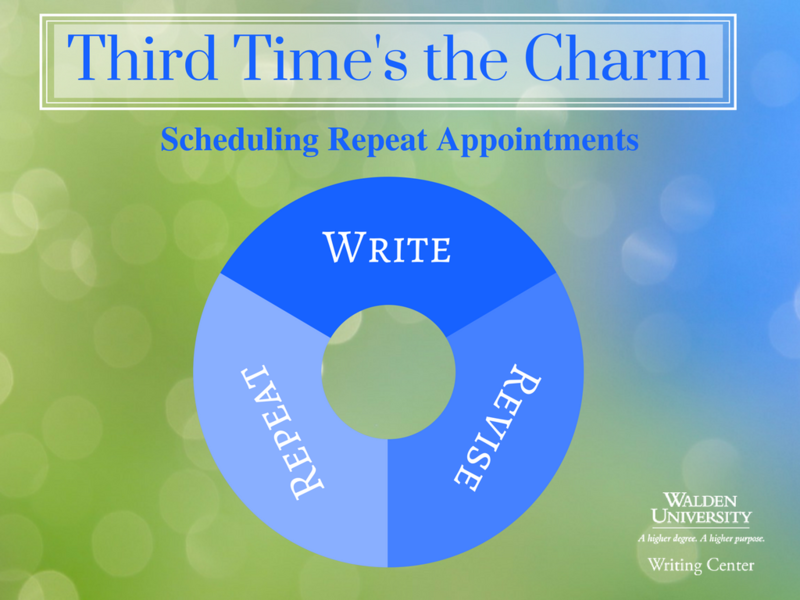 For optimum scheduling, we suggest you make an appointment between a week and three days before your next assignment is due and attach a rough draft. In your appointment form, let the instructor know what skills you’d like to focus on or have worked on since your previous appointment. At the same time you can reserve an appointment for the following week so that you can submit your work again once you have revised. At this point, we recommend that you read through your instructor’s feedback and consider the additional resources they provided. You should take time to implement changes to your entire document (regardless of if the instructor read all the pages or not) based on their suggestions and what you’d like to focus on. This will look different for each student, but your instructor will provide guidelines or areas of focus they suggest as you work to revise, add on to, re-organize, add citations, or whatever else you might focus on for this particular draft. Once you’ve revised, you can attach your work to your previously-scheduled appointment for the next week prior to the required deadline. After you receive your feedback from Appointment Three, you can revise again, based on writing instructor feedback. This revision may continue work on the same topics from the previous draft, or may shift to more focused and specific nuances in your writing. Either way, be sure to review your whole draft again with the instructor’s feedback in mind. Then you can submit your paper to your course. Now you can keep making appointments ahead of time or even for each assignment as your schedule allows. You can schedule appointments at the Writing Center up to two weeks in advance—so if you know you have papers coming up, you can plan to revise with us. If your schedule allows, two revisions of the same paper will make it even stronger! If not, then planning to visit before you turn in an assignment and keeping the patterns and resources in mind between appointments will still be beneficial. You can have up to two appointments a week, so pre-schedule whatever makes the most sense for your assignment due dates and schedule. Be sure to keep in mind that your paper will be returned the day of or after your appointment, so build that into your schedule as well. If you have a standing appointment or multiple appointments reserved in advance, you can attach whatever you’re working on that week, or cancel your appointment before the 5am EST deadline. Plan ahead—take a look at your course schedule to see when big assignments are due and when you plan to work on them. Submit old papers—you can submit something you’ve already turned in to get some revision practice and general feedback on your work to use moving forward. Reserve—reserve slots up to two weeks in advance! If you don’t feel you need or want an appointment that week, you can cancel as long as it is before the 5am EST deadline the day of the appointment itself. Make Goals—between reviews, keep track of what you’re working on in your writing and what you’d like to make stronger, clearer, or more effective. Keeping these goals in mind will help you revise more effectively between reviews and help your writing instructor focus on what’s most important to you as a writer! You can read more about making writing goals on our goal-setting page. Claire Helakoski is a Writing Instructor at the Walden Writing Center and holds an MFA in Creative Writing. 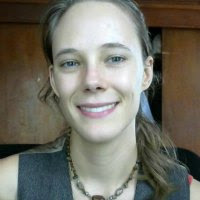 She has taught writing and Composition as well as acted as a writer and editor in a variety of mediums. She lives in Grand Rapids, Michigan, and enjoys reading, writing creatively, and board games of all kinds.